Let's play Enchanted Forest! The King has lost his treasures and is sending you out to find them. In the game of Enchanted Forest you'll be exploring the forest in search of these treasures. You're not done once you find these treasures. Now head back to the castle to find out if you have found the correct treasure. 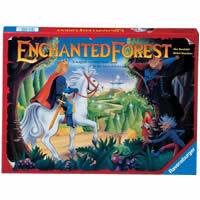 Enchanted Forest will have you racing around the game board in search of treasure. Your goal is to obtain the hiding place of at least three treasures before your opponents do. Check out Enchanted Forest for a suspenseful game of hide and seek. The players play out the rest of the story as they search the enchanted forest for hidden treasures. Their task is to find them, then report their hiding places to the king at the castle, but they must outwit the other players to get there first. The first player to indicate correctly three of the hiding places is the winner. Enchanted Forest contains a gameboard, 13 treasure cards, 13 trees with hidden treasures, 6 wooden playing figures, 2 dice and the Enchanted Forest game rules and instructions. Please keep in mind that the official Enchanted Forest childrens rules and instructions could be different depending on the game version you have. The rules below are some of the exact directions on how to play Enchanted Forest. Share with us your comments, funny stories, tips, advice, strategies, creative ways to play, questions about how to play, problems with the rules or anything you want about Enchanted Forest. All submissions will be reviewed within 24 hours. Click here to add your Enchanted Forest comments. After a quick glance through the game rules I think this might be a great fit for some of my grandkids - now where to get ahold of this game is the next challenge. I've seen this game every once in a while at my grandparents house and always thought the box looked dumb so we never played it. My cousin and I decided to finally try and play it but there were no rules so we just about put it away. We found them online here so after learning how to play we were hooked. I don't want to admit how many hours we tried to play. I guess never judge a game by the box.